Lara Croft can't go back to the way she was, says Crystal Dynamics' Brian Horton. Crystal Dynamics' Brian Horton spoke at Bradford's Animation Festival 2013, and let some information slip about the next Tomb Raider. Big changes are in store in the next chapter of Lara's development, says Horton. "Her life is changing," says he, "she can't go back to the way she was." The team's well into development, and while Horton didn't say for which platform, or give a release date, the suggestion seems to be that a new game could be announced much earlier than we might expect. As for what it might contain, writer Gail Simone has already said that her Dark Horse comic will lead directly into the sequel, and will involve a lot more globetrotting. 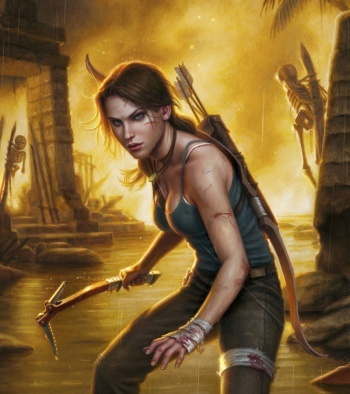 Horton was keen to stress that Crystal Dynamics technology developed for the Tomb Raider reboot had been designed with next generation in mind. He was less keen to talk cost. Tomb Raider, despite excellent sales, didn't hit Square Enix's target, possibly because costs were so high that only unreasonable targets had any hope of making a profit. "We don't talk about our budgets," Horton said. "We're not spending any more on a sequel than on the original game."